Form Description: A major part of business is keeping track of who has paid you, and who has not. Unfortunately, even the best of customers can have a bad week or month, and forget to send out their payment. For such situations use this Simple Request of Payment. It will allow you to accurately notify your customer of a delinquent payment, and allow you to keep accurate records at the same time. 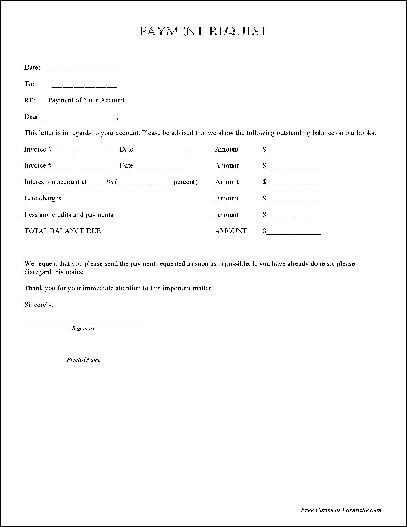 Simply fill out the blanks on the form, sign it, and send it off. Be sure that you keep a completed form in your records though. You can download a PDF version of the "Simple Request of Payment" form absolutely free. You can also, for a small payment, download a fully editable version of the form that you can customize as you desire. (Don't know which format to choose? Here's how to make your choice.) What would you like to do? Formville's free "Simple Request of Payment" form is associated with the following keywords: payment, business, request, credit, delinquent, initial.